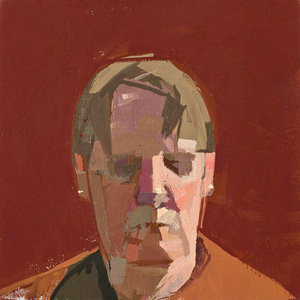 Catherine Kehoe's small paintings exert a force larger than one might expect considering their modest size, many at six inches square. Much of the power of her work springs from the visual language she has forged over her thirty years of painting from direct observation. Her pictorial vocabulary includes intriguing simplification of forms as well as surprising color and value. Other aspects of her work compound the effect of her skillful translations of her subjects, predominantly still lifes and portraits. Viewers are drawn by Kehoe's portrayal of the world stripped down, unveiled. Interest remains because her painted universe seems clearer, richer, brighter, more engaging than our own, with unpredictable revelations and a moving eloquence. While direct observation has long been part of Kehoe's painting practice, she is not concerned with copying reality. She seeks an "essential form," a reduction which leaves out as much as possible but is at the same time specific to what she is observing. It is a challenging blend of representation and abstraction that results in unexpectedly succinct depictions. 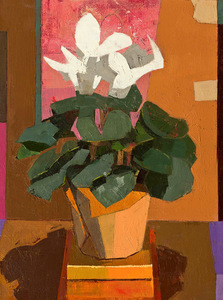 The artist's approach to portraying the visible is evident in a recent still life titled After February, a painting of a cyclamen plant where the foil covered pot is depicted in five clear, crisp planes and the flowers are translated into flat, white and gray biomorphic shapes, so convincing as luminous blossoms that their abstraction takes a few moments to perceive. The painting confirms Kehoe's hypothesis that translating forms "into simple, accurate shapes of color and value can create a truer likeness than detailed description can." Resembling many of her paintings, After February presents a concentrate of her subject that is more forceful, lucid, and stirring than elaborate renderings. Perhaps the most powerful pull to Kehoe's paintings, however, is her use of color and value, which imparts an incandescence to her work. She recently noted her "impulse for contrast and intensity" which frequently results in pronounced darks and lights along with saturated hues. Intertwined and always considered in the context of the total compositional space, color and value in her paintings are essential to the overall organization of the works. In her self-portraits, the contrast of light shades with darker tones also helps define the shape and volume of the head in addition to the space. 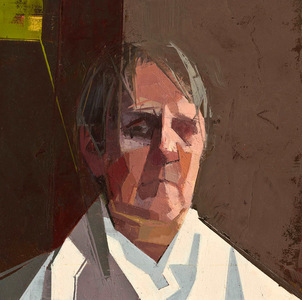 In Glimmer, a recent self-portrait, a brilliant white shirt and deep brown background establish structure and a sense of cast light, while dark and light planes carve the craggy forms of the face. The contrasts bring cohesion and form, as well as vigor to the painting. While notes of strong value spark Kehoe's paintings, color sets them alight. Bright, forceful, and concentrated hues occur throughout her work, and color seems to be one of the most personal and impassioned aspects of her painting. 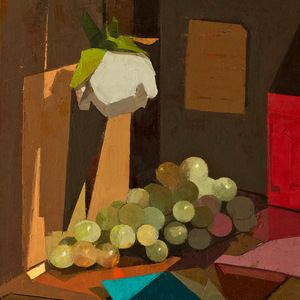 In many of the artist's still lifes, it provides a sensual balance to her crisp incisive planar depictions of forms, as a potent turquoise in Still Life with Grapes and shards of purple, coral, and green in After February demonstrate. In her self-portraits and figures, color regularly astonishes with dramatic translations of skin tones, clothing and environments: a diamond of deep red-brown and other reddish hues shape facets of the head in Glimmer, a single brushstroke of magenta helps construct the nose in Self-portrait in Red. Although recently she has introduced more neutrals and gray tones into her schemes, Kehoe has a proclivity for warm hues, for palettes skewed towards red, yellow, and orange, which heighten the sense of fierceness that often infuses her work. In Self-portrait in Red, a mysterious reddish background (Kehoe's colors defy identification) vibrates with the orange-brown cast of the shirt, demonstrating the artist's liking for hues close on the color wheel. That precise, startling red makes the painting resonate and crackle, and adds authority to the portrait. Yet its role as background space is made possible by all the other colors in the painting, drawing attention to the interdependence of the hues and forms in Kehoe's work. The enigmatic vermillion in Self-portrait in Red also points to the complexity of her pigments, never used direct from the tube, "mixed within an inch of their lives." One of Kehoe's achievements is her ability to sustain their power and brightness at the same time maintaining their refinement and intrigue. Finding unexpected form, value, and color in her subjects is essential to Kehoe's painting and her working process. She speaks about needing to discard the "everyday kind of seeing" that allows common navigation of the world to find unanticipated qualities and connections. As she recently described a still life, "It is a painting made with the intention of seeing beyond what I know and think. That is when translating the visible becomes interesting to me: when it tells me something I did not know." Those surprising encounters, the interesting moments, fill her paintings with a sense of adventure and drama in part due to the intensity of her hues, sharpness of the contrasts, and the simplicity of her forms. They generate vitality, warmth, and spirit throughout Kehoe's work and suggest that unpredictable—and exhilarating—discoveries can be found everywhere. Ann Finholt is an independent curator and art historian from West Hartford, Connecticut.